Halloween is coming, and part of the festivity means that a Halloween manicure is a must! This year, I happened to buy a neon orange nail polish, Illamasqua Gamma (which was also featured in a chalkboard manicure tutorial), and as you might expect, I couldn't wait to use it! 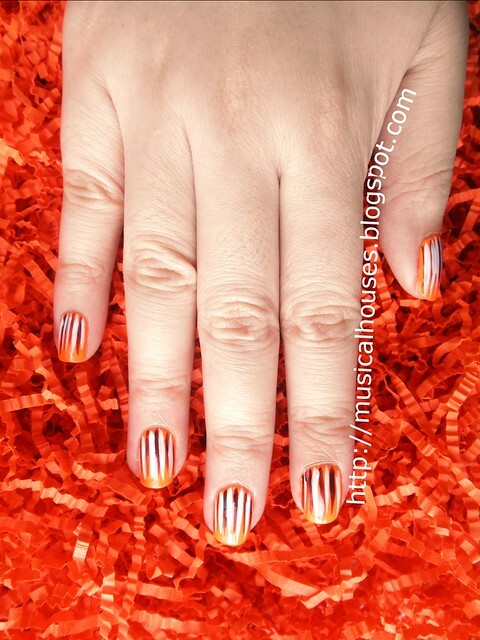 Halloween nail art - a very Halloween-y colour scheme! I combined this with a purple, Illamasqua Baptist, and a white (a random LA Colors white striper, which was last seen in my Easter manicure), and I got this! I've been seeing this stripey design around lately, so I thought, why not try this out with some Halloween colours? 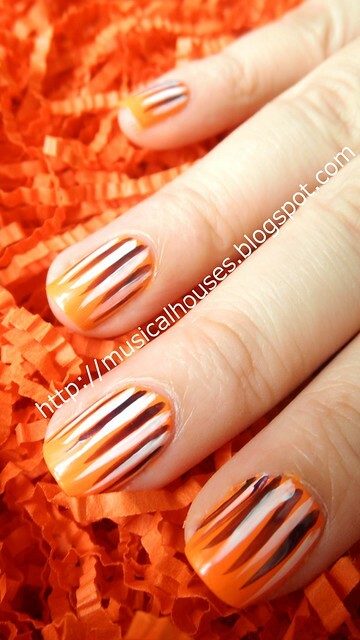 Halloween nail art: orange, purple, and white colours. Easy peasy Halloween nail art that doesn't take up too much time to do, too! I first applied two coats of Illamasqua Gamma, which is a really awesome neon orange, with a nice smooth application, much like other Illamasquas I have. Then I used a nail art brush (the same one I had from Born Pretty Store sometime back), and painted on the dark purple lines with Illamasqua Baptiste, leaving some gaps in between the lines. And then I added in the white lines with LA Color's whit striper. And tada, that was it! Halloween manicure this year - definitely easier than some of my previous years' manicures! Gorgeous - it's gone on my Pinterest board! This is gorgeous! It's Halloweeny but not tacky, know what I mean? Like it's better than just black and orange. I might just try this out!